Ember is reserved and happy to just hang out on her cat tree! She'd probably prefer to be an only cat in a quiet home. 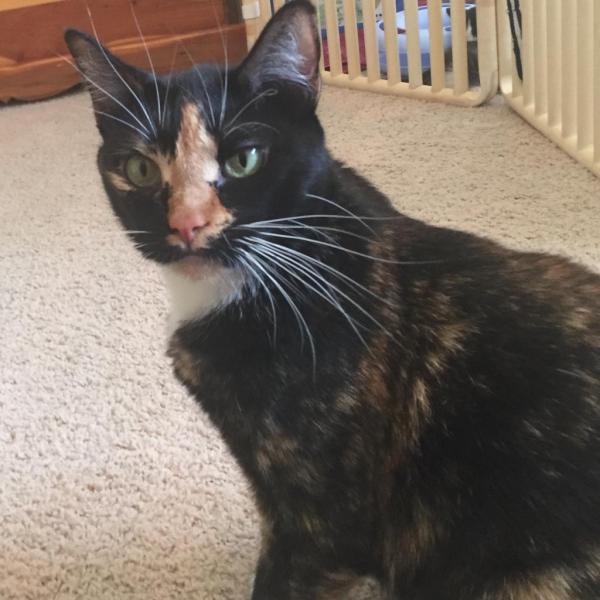 She is a colorful tortoiseshell, with an interesting copper blaze on her face. She loves to keep you company, but you won't be tied down by her sitting on your lap. Toys are her absolute favorite thing. In fact she collects them in a secret spot. Ember is 4 1/2 years old. OK with older children and well behaved dogs. Please enrich her indoor life with tall cat trees, scratching posts, hidey-holes, window seats, interactive play time with her humans, toys and nutritious food. If you're interested in adopting this lovely lady, please click below to fill out our adoption questionnaire.